Focus on function – 4 adjustable platforms allow for graded challenges to reaching & balance. 5 easy set-ups for improving balance in sitting and standing. Allows therapist to spot/facilitate patient from front, side or behind. 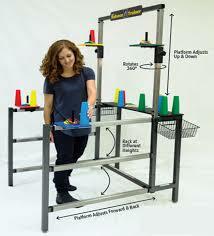 Comes with Balance Games – engaging and challenging ways to improve cognition, standing endurance & balance. Cross-disciplinary: PTs, OTs, & SLPs all use the ADL Balance Trainer. Integrates easily with existing equipment (harnesses, wheelchairs, standers, rocker boards, foam, etc. ).